Kevin Cashman talks about this intersection as it applies to leaders. On the one hand, a leader’s environment obviously affects what goes on in the leader’s mind and, in return, the leader’s mental processing generates responses and actions that impact his/her environment. External and internal, it is a dynamic whole. You cannot seriously consider leadership development without addressing both elements. 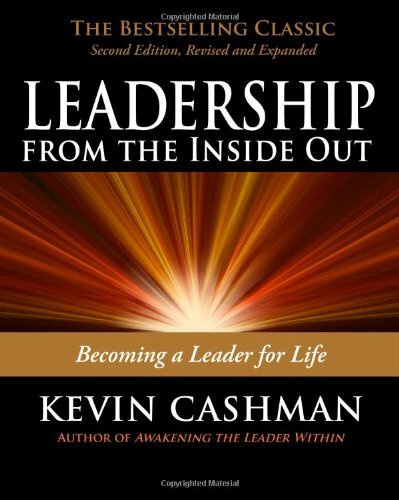 Cashman is right on the money when he says that typical leadership development programs in organizations concentrate pretty well exclusively on the “outside,” the doing part: leadership actions, behaviors, competencies, techniques, and so forth. For this reason he has chosen to focusLeadership from the Inside Out on the “inside” or being part: how you go about continually growing your inner self as a leader. The book is about growing the whole person as the way to grow an excellent leader. Finally, at the end of each mastery area’s chapter he lists practical activities to develop yourself in that particular area. The seven areas do not suggest any sort of sequential plan or stages of development. Rather, we are to see them as integrated, ongoing processes. You can be working to get clarity around your goals and priorities (Purpose mastery) at the same time as you are enhancing your ability to build stronger relationships (Interpersonal mastery). I agree wholeheartedly when Cashman says that inner mastery work requires a lifelong commitment. You can’t complete it with a few workshops or six months of coaching. The best leaders never cease to engage in self-observation, soliciting feedback from others, reflection, and continued self-discovery. Why is there no “quick fix” on the internal side? Because these unconscious beliefs and maps of reality that we all carry around inside us are deeply ingrained. They determine or at least heavily influence our external behavior. But because they are mostly below our level of awareness, we don’t see them operating. Furthermore, we don’t know that we don’t see them. The only way to release ourselves from their grip on us is to bring these limiting beliefs and thinking habits into the light of day and consciously develop new pathways to effectiveness. This is where this book comes in. For the balance of this review I want to shine the light on a few points that particularly resonated with me from Kevin Cashman’s seven master practices. Personal Mastery and Purpose Mastery. Some lead through the force of their character but most managers lead more through a coping strategy. They genuinely try to get results but divert too much of their available time and attention to maintaining their own image, security, comfort and control. Obviously we can’t expect people to ignore their personal concerns altogether but the best leaders prefer their behavior be determined by their strong character and compelling goals. Interpersonal Mastery. Cashman quotes a Saratoga Institute study of recently departed employees and their respective managers. 85% of the bosses said their employee left for greater opportunity and more money. But, 80% of the former employees cited the reason for their departure as a poor relationship with and lack of coaching from the manager. I wonder how many of the “departees” were too valuable to lose. Your interpersonal mastery level has a huge impact on your overall effectiveness as a leader and, by extension, on the results you get. Change Mastery. If we accept the idea that managers work with what exists and leaders go beyond to what as yet does not exist, then leadership is all about creating change. Being Mastery. Some form of reflective quiet time, ideally including mind-focusing meditation, provides a way to uncover your deeper purpose and develop that calmness under stress that people trust and are attracted to. Action Mastery. The performance coach needs to call for the client’s commitment to new behavior and then hold him or her to the pledge. Zenger Folkman research indicates that 50% of the impact of training comes from post-workshop skills application back on the job, supported by coaching. An ASTD study shows that post-training coaching boosts the impact of the training by 73%. Without the will and discipline to act, you have no leadership effectiveness. The bottom line of recent research-and of this book-is that to achieve a significant degree of mastery as a leader we must attend to mastering ourselves. This book provides a lot for all of us to consider…and then take action upon! Ian G. Cook is a trainer, keynote speaker, and facilitator and, since 1988, Principal of the leadership development firm, Fulcrum Associates Inc. He works with managers who want to increase their effectiveness as a leader and build a stronger team. Ian invites you to contact him regarding the ideas in this article or to discuss challenges you face around building strong leadership at all levels of your organization, the kind of leadership that generates strong results and gives your enterprise an enduring edge. He can be reached at 1-888-FULCRUM (385-2786) or Contact Ian or visit his blog at: BuildBestBosses.com. You may purchase this book Here or from the Books page.